Charles Robert "Charlie" Watts (born 2 June 1941) is the drummer of The Rolling Stones. He is also a jazz bandleader and commercial artist. Watts is sometimes referred to as "The Wembley Whammer" when introduced by Mick Jagger during a concert. 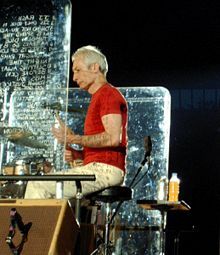 There are many online references to Charlie Watts being vegetarian, some from reputable sources, but no specific evidence given for any of them. If anyone has anything more do let us know. See also Mick Jagger - there are even more listings of him being vegetarian, with even less reliability.